Global Mixed Race, the third biennial Critical Mixed Race Studies Conference, will be hosted at DePaul University in Chicago, November 13th-15th, 2014. It will bring together scholars from a variety of disciplines around the world to facilitate a conversation about the transnational, transdisciplinary, and transracial field of Critical Mixed Race Studies. The 2014 conference is organized in partnership with DePaul’s Department for Latin American and Latino Studies and the Center for Intercultural Programs, and the non-profit organization Mixed Roots Stories. 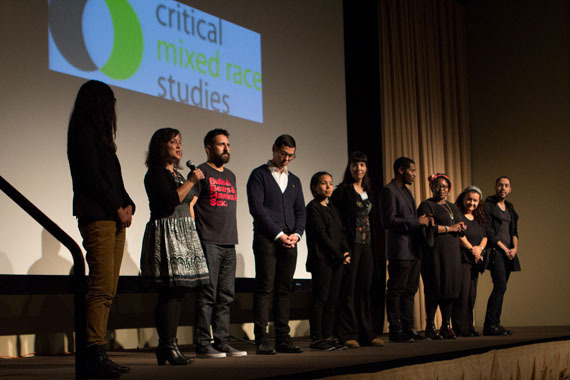 CMRS 2014 is also co-sponsored by DePaul’s Office of Institutional Diversity and Equity, African Black Diaspora Studies, Art, Media, & Design, Center for Latino Research, Critical Ethnic Studies, Global Asian Studies, Irish Studies, LGBTQ Studies, and Women’s and Gender Studies. View the final schedule here. Mark your calendars, book your flights and hotels, and be sure to register (it’s free!) for the 3rd biennial Critical Mixed Race Studies Conference “Global Mixed Race” November 13-15, 2014 at DePaul University in Chicago. Rebecca Chiyoko King-O’Riain, Senior Lecturer, Department of Sociology, National University Ireland Maynooth and coeditor of Global Mixed Race (forthcoming New York University Press, 2014) will be our featured CMRS keynote. Also from Ireland, Zélie Asava will be our featured Mixed Roots Stories keynote. She is the author of The Black Irish Onscreen: Representing Black and Mixed-Race Irish Identities on Film and TV (Peter Lang, 2013). Join us for three days of scholarly panels plus an exciting line up of arts and cultural programming organized in conjunction with Mixed Roots Stories including: feature film screenings, an evening of short films, a live performance evening, and arts and culture panels and workshops across the three conference days. CMRS 2014 will also include an info fair and caucus meetings. This conference is open to the public and all are welcome. CMRS creates a dynamic environment where senior and junior scholars, students, activists, artists, community, non-profit and student organizations, and the general public can network and share. There are some incredible opportunities out there right now to get certificates, higher ed and even advanced degrees specializing in the experience of Americans of color. Want a degree in Asian American Studies? Sure. How about African American, Native or American Indian, Latin American, Mexican American or Chicano studies? Absolutely. Google [Search] all of these and you’ll find brilliant choices to be credentialed in these heritage experiences at very fine colleges and universities. Comments Off on Why isn’t College for Learning About Mixed-Race Identities? It’s something that needs to be considered. As multiracial identity becomes the Asian American mainstream—by 2020, it’s projected that one out of five Asians in the U.S. will be multiracial; by 2050, that ratio will exceed one in three—the population of persons with one-fourth Asian heritage or less is poised to spike. King-O’Riain concludes that the mixed-race challenge to racial understandings of Japanese Americanness does not necessarily mean an end to race as we know it and asserts that race is work—created and re-created in a social context. Ultimately, she determines that the concept of race, fragile though it may be, is still one of the categories by which Japanese Americans are judged.